Tomar una clase de cocina es una excelente manera de descubrir la cocina italiana y esta clase magistral privada está hecha a medida para familias. Ponte en práctica mientras preparas auténticas pizzas de horno de piedra, diviértete creando tus propias coberturas personalizadas y luego sumérgete en una deliciosa cena de pizza casera. 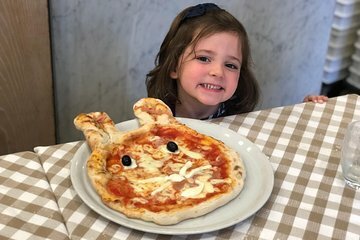 Aprende los secretos de la pizza tradicional italiana. Ponte manos a la obra mientras amasas la masa, mezclas las salsas y horneas las pizzas en el horno de piedra. Siéntate a disfrutar de tu cena de pizza casera en familia. El tour privado asegura una experiencia personalizada y la atención indivisa de su guía. Wife, kids loved it. Serena got the kids fully engaged- but even the wife and I had a great time. Got to sit down for a nice dinner and wine after baking our own pizzas. We had the Private Pizza Master Class in one of the rome localities in an authentic pizzeria.The experience was very nice for all of us. Each of us made a Pizza each so we had 5 large pizzas which became too much to eat. I would recommend booking a time when you can time it with your lunch time or dinner time else you would not be able to do justice. Super fun! Kids loved! We loved. Daniele our waiter was a phenomenal host. We had lunch. It was SO much pizza. Basically 14" pizza per person! So tasty. Fun fun fun family activity. Would book again!! Our boys really enjoyed this - great fun. The chefs were really hands and encouraging with the kids, suprisingly given the mess the made the pizzas were really good too! The children loved this!! The chefs were so patient and kind. Loved the pizza!! My kids LOVED it, we LOVED it! We have 4 boys, two 11 and two 13. I was worried that they might be too old to enjoy it, but it was one of our favorite activities on our Rome trip.